In this article I will show you how to Install Grub4Dos to your Hard Disk using a tool called Bootice .Bootice is a utility to modify or backup/restore your MBR(Master Boot Record) or PBR(Partition Boot Record).Bootice supports a lot of bootloaders including Grub4Dos. I have used grub4dos bootloader and bootice in Kaspersky Rescue Disk 10 Bootable USB Creator . Download Bootice and the latest version of Grub4Dos . Extract the contents of the downloaded archives using archiving tools such as 7-zip. Run Bootice with Administrator Privileges. 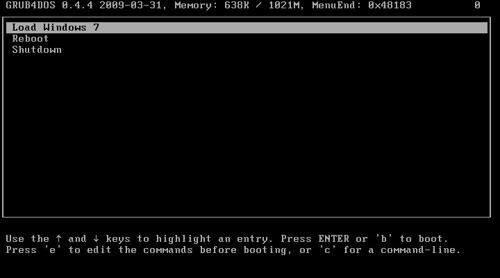 Now select Grub for Dos and click on Install/Config. You can install Grub4Dos without modifying the MBR or PBR by just renaming GRLDR to NTLDR or BOOTMGR. You can visit the Grub4Dos Forums at Reboot.Pro for more advanced information such as booting iso files etc. Check grub4dos-chenall for latest version of Grub4Dos with additional features. Bootice is a great tool that can access all the partitions on a USB drive – even in Windows. step 7 clicking on grub 4 dos wasn’t available for me to click on. only UltraISO USB HDD+ UltraISO USB-ZIP+ Windows NT 5.x MBR and Windows NT 6.x MBR was selectable. What do i do? Try logging in as Administrator. RMPrepUSB will install grub4dos at the click of a button and will clean/partition/format/test/make bootable your USB drive too as well as test them for size and speed and make backup/restore images, etc. i make it all of them but understand what should i do noww.. i guess its missing something. Thanks for this. Spent hours with Hirens boot CD and various MBR editors trying to get a system to boot after a power spike reset the BIOS settings. While the data on the boot drive was intact, every effort resulted in ‘BOOTMGR missing’ and ‘Operating system not found’ errors. This worked first time and it booted straight into Windows 7.